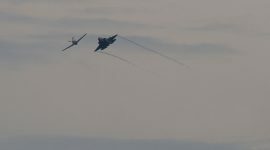 An F-35 and P-51 Mustang fly in close formation at the Canadian International Air Show 2018. Click image to view larger. 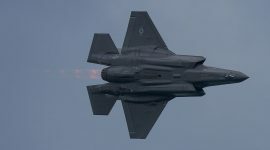 Underneath the mach diamonds of an F-35 at the Canadian International Air Show 2018. Click image to view larger. 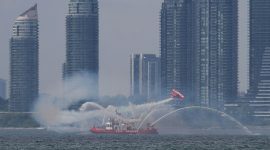 The Lucas Oil Pitts buzzes the William Lyon Mackenzie at the Canadian International Air Show 2018. Click image to view larger. 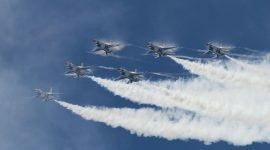 Condensation forms over USAF Thunderbird F-16s flying in formation at the Canadian International Air Show 2018. Click image to view larger. 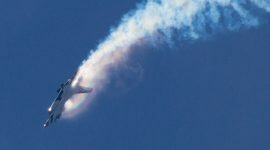 Condensation forms a rainbow over an inverted USAF Thunderbird F-16 at the Canadian International Air Show. Click image to view larger. 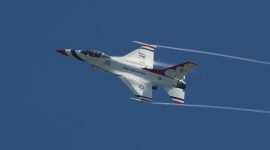 Condensation forms on the leading edges of a USAF Thunderbird F-16. Click image to view larger. 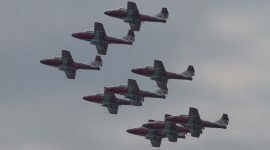 The snowbirds fly in close formation over the Island at the Canadian International Air Show 2018. Click image to view larger. 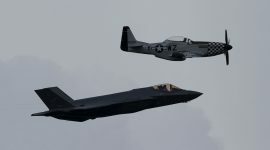 A P-51 Mustang and F-35 fly together against hazy skies at the Canadian International Air Show 2018. Click image to view larger.